We have been very lucky in the Touring Picture Book Club, so be able to choose the very best of the best books for our posts and this latest one is a beauty! Not only is it by one of my favourite children's writers, it's illustrated by one of my favourite illustrators. The Boy and the Bear by Tracey Corderoy and Sarah Massini is the magical story of a little boy and a very special friend. The little boy in this story is very lonely. He just wants to play but he has no one to play with. When he receives an invitation to play from across the pond in the form of a paper boat he seems to have found the best friend he is looking for. But really it's just Bear - not quite the friend he imagined. Bear doesn't know how to play hide-and-seek or see-saw or catch. 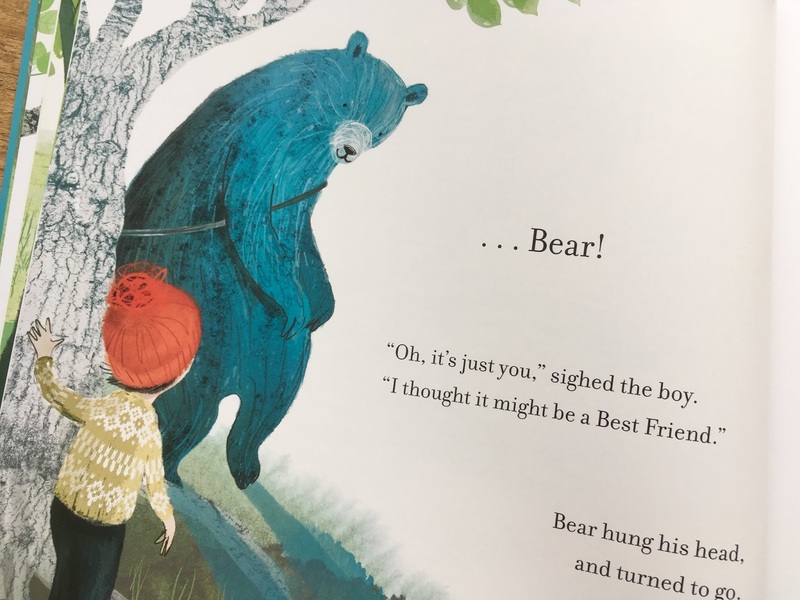 But perhaps what Bear can bring to their friendship might mean so much more. When he starts building a treehouse, the boy becomes fascinated and a magical summer begins and an autumn full of fun. But as the snowflakes start to fall, Bear knows he must go. And one day he disappears. It is with this disappearance that Boy realises what their friendship meant to him. As the season changes to Spring, they pair are reunited with a big friendly bear-hug. A story about unlikely friendships, and belonging. 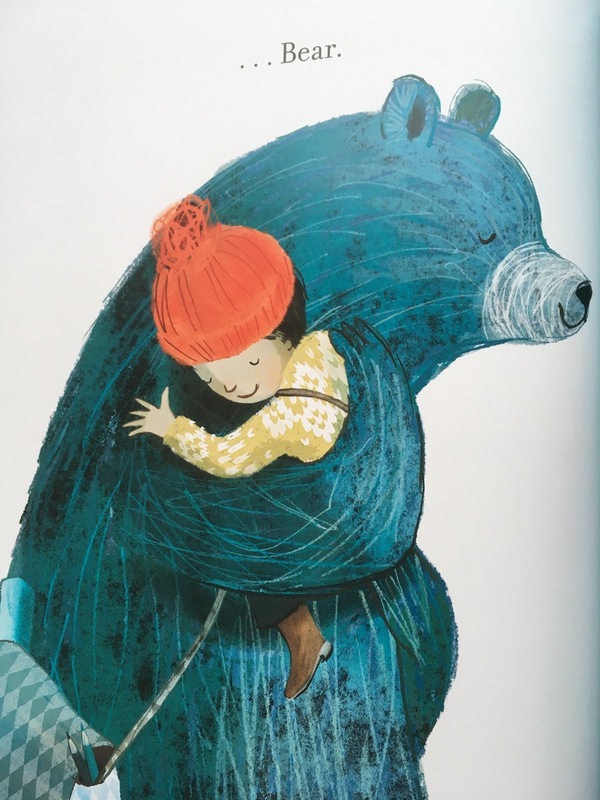 With beautiful illustrations that capture the changing seasons and the gentle relationship between Boy and Bear. And the lyrical text makes it a joy to read, and to listen to. A perfect story for enjoying on a frosty winter's day to warm up with the enduring power of love and friendship. 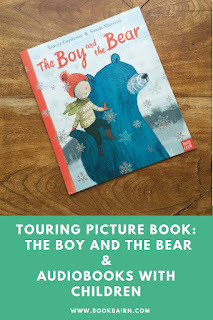 Did you know that most picture books that are published by Nosy Crow, like The Boy and the Bear, have a QR code inside them that you can scan and listen to an audiobook version of the story for free? And many are also available to download on their podcast? It's such a great bonus extra. We love listening to audiobooks! Especially ones that we have the picture books to hand so we can look at the pictures as we listen. It's great for us because sometimes BookBairn really wants a story but I just don't have my hands free - perhaps it's the middle of cooking the tea or because we are in the middle of eating tea - but I can pop my phone on the table and press play and her favourite stories are read to her without me having to look at the pages whilst trying to do one of the 12,864 things I try to juggle at once! In the car - we like to listen to stories in the car and often borrow audiobooks on CD from the library or play through my phone on the cars speakers. It's great for longer journeys when you've all had enough of the same songs on repeat. Sometimes we take the book along with us too so BookBairn can turn the pages as she listens. We listened to both What the Ladybird Heard by Julia Donaldson and Lost and Found by Oliver Jeffers so many times that BookBairn learned them both by heart. In the kitchen - at dinner time BookBairn can sometimes find it hard to focus on eating her tea and it can be a long slog through the whole process so we listen to the Nosy Crow podcast of books that she is already very familiar with and doesn't require the pictures to follow along with the story. 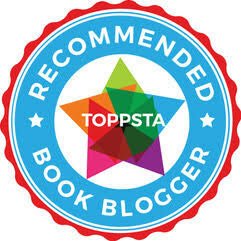 Our favourites are Neon Leon by Jane Clarke and Lionel and the Lion's Share by Lou Peacock. Together - sometimes it's just nice to curl up together with the book and listen to the story together. When we are both the listeners. It's a great skill to be able to listen and it's good practise for BookBairn but it's also nice for me to get to listen too. As I said we use the library to get audiobooks, and listen the Nosy Crow ones but we also have quite a few on through Audible. I have a subscription to Audible as I enjoy listening to audiobooks myself but you can also use it to download children's stories. At the moment there is an offer on for Audible where you can get the first four months for £3.99 which is a bargain deal and you can use your 1 credit each month to download any book. 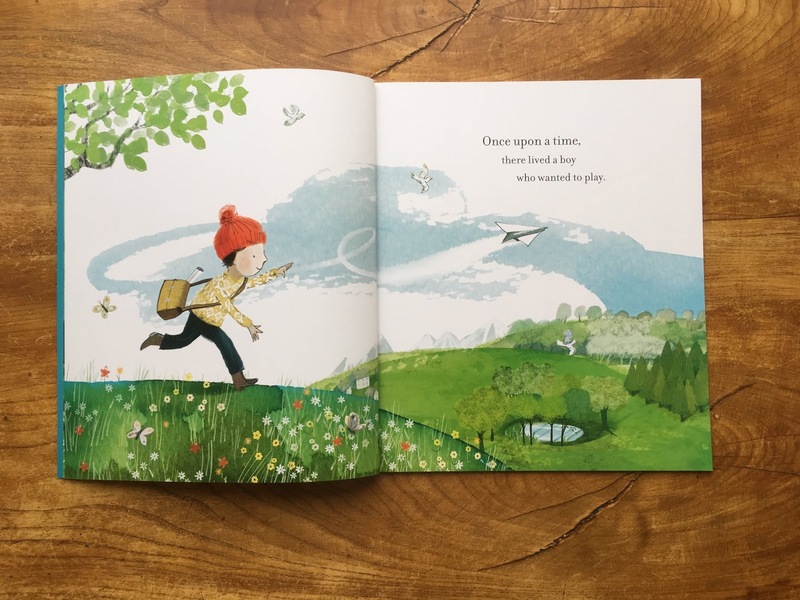 But the children's books are often incredible value - many Julia Donaldson books are less than £5, the Oi Frog series are less than £3.50 and most Oliver Jeffers books are £1.74! I mean that's less than a children's magazine or a coffee and you get to keep the audiofile forever. It's yours! Also you can use your credit for a book for yourself and then pick one up for the kids when they are on sale. (And another tip with Audible is that you can return a book if you don't like it and get your credit back.) 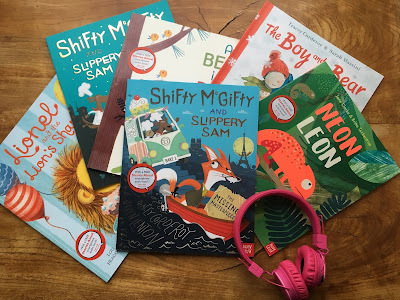 You can also purchase these audiobooks through Amazon as a one-off fee without a monthly membership and I'm working on a shopping list of our favourites for my Amazon shop. If you are interested in a free trial of Audible here's a link. And if you are interested in the limited time deal of four months for £3.99 (which is less than my current membership fee - reminding me to take up the offer!) here's a link for that! 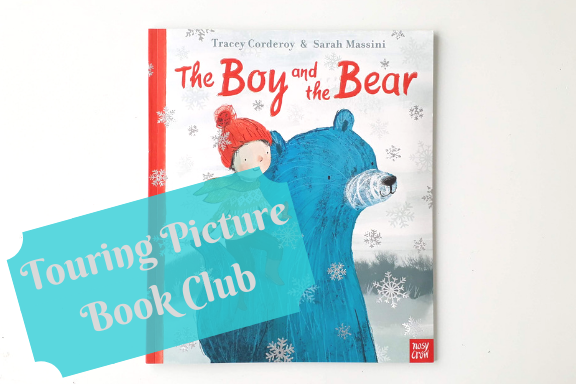 Check out the other activities happening across the Touring Picture Book Club and pop over to our Twitter to be in with a chance of winning a copy of The Boy and The Bear of your very own! And look out for our next touring picture book which will be in the New Year! They are really good and great for listening to when you are doing something else like colouring in or play dough! That's a bit annoying! I have to have the volume up full when I'm using my phone through the speakers but it works well! Sounds like a great book. I’ve never tried an audio book but I know I can download them for free from the library. Might give it a go. And I know that you did! I hope you enjoyed it! Oh dear - the perils of CDS. At least now an MP3 file shouldn't wear out from too much use! This sounds like a beautiful story! None of us have ever listened to audiobooks, but they were brilliant for my grandma when she lost her sight. Right now, I like to read books and listen to the radio! I think it's about finding what works for you and they absolutely would never replace us actually reading aloud ourselves. There's way more magic in that! I love audible so much - it's basically why I go to the gym - so I can squeeze another chapter in! It's great for tea time and for simple activities like colouring and playdough. I love them! I was just telling a friend about this one! I love how the author and illustrator really stepped up their creativity!